From the outside, Samantha Reed seems like the perfect rich girl. Her mother is a politician, she goes to private school, works at the country club pool during the summer, and never gets in any kind of trouble. The Garretts next door however, are quite the opposite. They are loud, affectionate, all over the place, and there are just so many of them. Samantha has spent most of her life watching them from her balcony, until one night when Jase Garrett climbs up to meet her and brings her into his world. This was a really cute story! Jase and Samantha’s families are totally opposite–Samantha’s mother seems to want nothing to do with her half the time and is only concerned with her own career, but Jase’s mother is constantly surrounded by her children and is always putting them before herself. Jase’s father owns a hardware store and is still affectionate towards his wife, but Samantha doesn’t even remember her father because he left when she was very young. When Samantha becomes involved with Jase, his family welcomes her with open arms, yet Samantha still hides her relationship from her mother because she knows she wouldn’t approve. I really loved both Samantha and Jase. Jase expects Samantha to be a spoiled rich girl but she is definitely not like that at all. She is strong and independent and when Jase’s family needs her to help babysit she jumps in and does her best despite not having any experience. Jase is like the perfect boy–he works at his father’s store to earn money for his own car, he practices sports early in the morning so that he can get a scholarship to a good college, he loves all of his brothers and sisters and has no problem taking care of them all the time, and he is really respectful and loving towards his parents. He treats Samantha really well also, and the two seem to fit together perfectly. There were definitely some heavy issues dealt with in this story as well–drug and alcohol addiction, drunk driving, and parenting issues–and Fitzpatrick did a great job of handling these. This is definitely a story about first love, but it is also so much more. Fitzpatrick did a great job of developing each character throughout the story, and even the youngest Garretts had their own distinct personalities that allowed them to leave an impression on the reader. Overall, My Life Next Door was a cute story about first love and the many issues that come along with it. It’s a quick read and something that I really enjoyed. 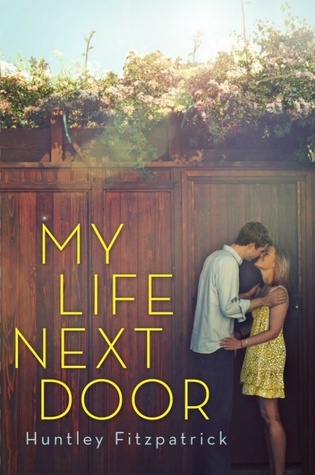 My Life Next Door was released on June 14, 2012 and is the first book in a series. The second book, The Boy Most Likely To, is set to be released in 2015 and features Samantha’s friend Tim.